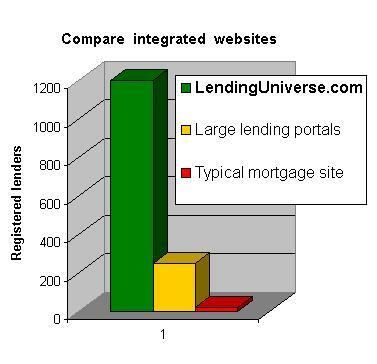 LendingUniverse.com has the largest overall number of registered brokers and lenders on the Internet. The most respected lenders like Bank of America, Wells Fargo, Idymac Bank, Washington Mutual are among all other major participants. Thousands of local mortgage brokers. Thousands of local and specialty lenders. Hundreds of Private Investors who can fund loans that banks won't touch. All lenders are integrated to appraisers, escrows, notary publics, title companies and other service providers. LendingUniverse.com is not a broker and does not favor any particular lender. It is the only market place where anyone can participate in a true bidding competition to the sole benefit of the borrower. Commercial, residential, land and any other imaginable loan, including international loans. No limit on loan size. Personal and credit card loans from $500 up to $500,000,000 or more. Immaculate track record of performance and excellent service to all our members. Patent pending control center for the benefit of our clients. Super Affiliate program that will pay you not just on your referral but on second and third tiers of people you refer through other affiliates. Strong support to ensure you are making a lot of money with our Super Affiliate program.